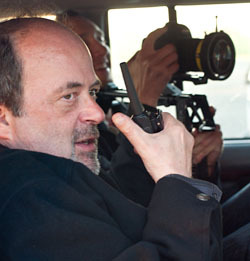 British writer/director/actor Matthew Jacobs has lived in the Bay Area since the early 90s. He is best known for his writing credits on The Emperor’s New Groove, Doctor Who and The Young Indiana Jones Chronicles. As a director he has concentrated on smaller more personal films. His BBC/BFI London-based movies Hallelujah Anyhow (1992) and Mothertime (1998) played festivals worldwide including Sundance, Seattle, Edinburgh and London. Now with Your Good Friend (2014) and Bar America (2015) he has moved his directorial focus onto American subjects. Matthew has also returned to acting in the past six years most notably playing co-lead with Danny Huston in Bernard Rose’s Boxing Day – a feature film adaptation of Tolstoy’s “Master and Man” which premiered at the Venice Film Festival in 2012 and at the Los Angeles Film Festival 2013 to rave reviews. As with practically everything I’ve ever made, Bar America explores the simple question: can a dysfunctional love become functional? The stories of Charlie a gentle good-hearted ex-marine, and his undying loyalty to Hank a functioning alcoholic, are based on real people and it was that truth that drew me to making Bar America. The plot however, is the stuff of conventional bro-mace and dramady, with an out-an-out bad guy who’s simply out to destroy relationships. The screenplay was written in meticulous detail, but like so many films today, the actual dialog was mostly ad-libbed. This freed us so we could use a mix of brilliant young professional actors and people off the streets. I have tried to direct a film where the performances rule and I hope it achieves that.